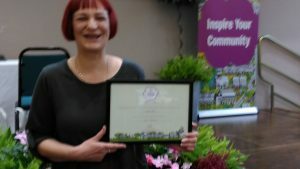 Knighton Wild was awarded Level 3- Advancing at the It’s Your Neighbourhood Awards in Leicester for our work in St Mary’s Churchyard in Knighton. The award reflects the work that we have put in to the churchyard, but are at the early stages compared to some well established groups. The top level is 5. The award is marked on three categories: community participation, environmental responsibility and gardening achievement. You can read our submission here: Knighton Churchyard Wildlife Area IYN Assessment 2017. Our aim is to improve this for next year’s awards, and the work we have done in laying the hedge contributes to that. The next activity is likely to be making and installing bird nesting boxes.